Franklin Dollar, assistant professor of physics and astronomy, grew up on a reservation in a home with no electricity. Now he studies ultra-high-intensity laser-plasma interactions and works to increase diversity in scientific fields. After earning a Ph.D. in applied physics at the University of Michigan in 2012, Dollar became a postdoctoral scholar at the University of Colorado Boulder’s JILA institute. 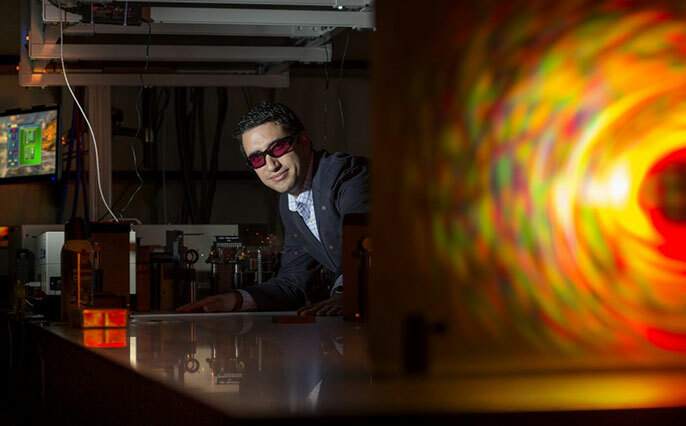 He investigated X-ray source production with high-intensity lasers, a pursuit he has continued in his own lab since joining UC Irvine's Department of Physics & Astronomy in the fall of 2015. He also participated in drafting a proposal to procure National Science Foundation support for a new Science & Technology Center to explore how imaging modalities such as X-ray, optical and electron microscopy can be improved and combined to help answer some of the most complex and challenging questions in medicine, chemistry, physics and other areas of science. The effort paid off; last fall, the NSF announced a five-year grant of $24 million to fund the Science & Technology Center on Real-Time Functional Imaging, with Dollar as head of its work here at UC Irvine. Boasting research locations at UC Irvine, UC Berkeley, UCLA and the University of Colorado Boulder, as well as education sites at Fort Lewis College and Florida International University, STROBE — as it’s called — will meld cutting-edge imaging research with learning outreach to underrepresented populations, with a focus on Native American and Hispanic students.